“If you can’t see my mirrors, I can’t see you.” If this phrase does not sound familiar to you, it should, as it is printed on a sticker that is on the back of just about every big rig trailer in the country. A big rig’s load is huge, to say the least, which means that its blind spots are pretty vast as well. Because of this, accidents involving big rigs and lane changes are not all that uncommon. When a trucker moves from one lane to the next, they may take every precaution to prevent an accident, including checking their mirrors, looking over their shoulders and using their turn signal. Despite these measures, however, they can still end up sideswiping a vehicle in the next lane. When this does occur, both the trucker and the driver of the other vehicle want to know, who is at fault. It all depends. Florida operates under a pure comparative negligence standard, meaning that parties of an accident can share liability, and if they do, the plaintiff is not entitled to the full amount of compensation he or she would have received. Instead, the award would be reduced by the percentage of fault they assumed. For instance, if a judge determined that a plaintiff was 30 percent liable for an accident, they would only receive 70 percent of the determined award. 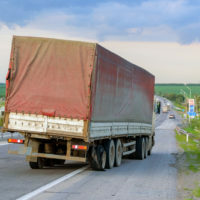 This is an important concept to keep in mind, especially when filing a claim after a big rig lane changing accident, as it is possible that both parties—the big rig operator and you—were somewhat at fault. The truck driver was weaving in and out of lanes. Typically, when a driver is guilty of any of these mentioned above, it is because they are tired, distracted, or intoxicated, all of which can be proven with driving logs, phone records, cab cams, and a BAC test. You attempted to change lanes in an intersection. You and the trucker may share liability for your accident in a number of different ways. For instance, the trucker may have failed to use his or her turn signal, but you may have been speeding and texting when he changed lanes. In another instance, both you and the truck driver could have been weaving in and out of traffic and not paying close attention to your surroundings. If there is any possibility for shared liability, the insurance agencies will find it, which is why it is important to be honest about what you were doing prior to the accident, and why it is even more important to show how the truck operator was in the wrong. At Spencer Morgan Law, our Miami truck accident lawyers are prepared to thoroughly investigate the circumstances leading up your accident, make all the necessary inquiries on your behalf, and build an irrefutable case. To speak with a member of our legal team, contact our office by phone or online to schedule your free consultation today.